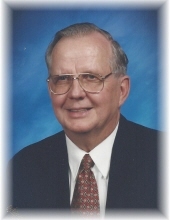 Jerome H. Ludwig, 85, of Bowling Green, Ohio and formerly of St. Joseph, Michigan passed away Saturday January 19, 2019. He was born March 31, 1933 in St. Joseph, Michigan to Robert and Margretta (Kahler) Ludwig. He married Genevieve Edwards on November 27, 1957 and she survives in Bowling Green. Jerome was a chemist, obtaining his PhD in Organic Chemistry from the University of Cincinnati. He dedicated his life to chemical research and development, working at a variety of companies and serving in a variety of different roles throughout his life. Along with his wife of 61 years, Genevieve, he is survived by his daughter Jerri Fretter of Bowling Green, Ohio, brother Richard Ludwig of Scottsdale, Arizona and five grandchildren. He was preceded in death by his son Mark Ludwig. Services for Jerome will be private for the family. Arrangements have been entrusted to Dunn Funeral Home in Bowling Green. Memorial contributions may be given in his memory to the Alzheimer’s Association. To send flowers or a remembrance gift to the family of Jerome Ludwig, please visit our Tribute Store. "Email Address" would like to share the life celebration of Jerome Ludwig. Click on the "link" to go to share a favorite memory or leave a condolence message for the family.